We offer a wide selection of Made in USA floor sanding abrasives. Our floor sanding discs are manufactured from heavy duty combination cloth and paper. 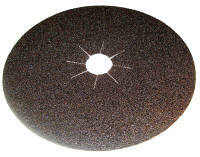 They are special coated with silicon carbide grain for use on all popular floor sanding machines. Each disc has a 2" diameter center hole. Grits 12 to 24 are open coat, and grits 36 to 120 are closed coat. Sold in boxes of 10 discs. The prices below are for a box of 10 discs. Part number with box price underneath .